Print inspection systems are benefiting from advances in software algorithms that improve the reliability of automated quality control. Futec Europe is one company that has released new software for its print inspection machines, which it was previewing at the Drupa print show in Düsseldorf, Germany from 31 May to 10 June, while Stemmer Imaging’s Common Vision Blox software now has a module called Flexinspect designed specifically to handle variation in print webs. ‘A lot of 100 per cent print inspection systems have struggled with the fact that there is an acceptable amount of variation in print runs,’ explained Mark Williamson, director of corporate market development at Stemmer Imaging. ‘There might be slight jitter at the edges, or different thicknesses of ink, especially when printing on plastics. There can also be variation when printing multiple layers. A good print inspection system, if it’s inspecting at the end of the run, should be able to deal with all these differences in the final product.’ Stemmer Imaging’s Flexinspect module is designed to do this. Tension and flexing in the print line can make examining flexible materials like thin polyethylene films, for instance, difficult to do with machine vision. Expansion or contraction of the material can cause false defects to be flagged by the monitoring system. Futec’s ‘Elastic Freeze!’ software feature will ignore any variation in the images caused by the material flexing, noted Silvio Neumann, sales manager at Futec Europe. The software measures several known points in the image, and any movement in the material in the machine and cross direction can be compensated for by calculating the distance between those fixed points. It will ignore a value of extended length, for instance. The Elastic Freeze! function is a two-step calculation: one for web movement, and one for the extension or contraction of the material. 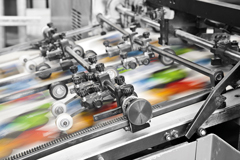 Typically, an inspection system will monitor the entire print run and the print house will get a report after the run has been made identifying each defect on the web, according to Neumann. The operator then has to decide how to classify each defect – which has to be cut out or reported to the customer, and which is just used for internal process quality control. ‘Not every flaw picked up by the inspection system is one that needs reporting to the customer,’ stated Neumann. In a traditional setup, image analysis programs subtract the recorded image from a golden image of what the part should look like. Variation in the product would be dealt with by desensitising certain pixels in the template. ‘If you have a transition from an edge and that edge moves around, you would have to set a desensitisation around the edge. That’s difficult to do. And if you did get a defect at those points you wouldn’t see it,’ explained Williamson. Finding very small defects across the entire web with these systems is therefore a challenge. ‘The systems worked, but they were so difficult to set up and they had to be tuned to be not very sensitive, especially on products like plastics where there can be significant variation across a web,’ Williamson continued. Also, line scan cameras can give variations at the edges of the images compared to the centre. The complications in setting up the system and then tuning it to allow for variations meant that, especially for shorter jobs, the inspection system could end up just getting turned off, according to Williamson. Stemmer Imaging’s Flexinspect creates lots of different models, which account for any variation in the images. The operator first puts the software into ‘learn’ mode for about 150 images, which takes a couple of seconds. It identifies differences that are repeated in subsequent images until it doesn’t detect any other changes to learn the variations. ‘Rather than having to specify variations and tweak parameters, the system will learn what is good and bad and tell the operator once it thinks it has enough data,’ Williamson explained. When the software then goes into inspect mode, it will only show a defect that is outside the variations of change documented in the learning process. ‘We’re quite excited about Flexinspect and what it can do to simplify setting up the system. It automates the way variation is learnt manually,’ stated Williamson. Futec uses line scan cameras for its systems, along with inspection boards to carry out the image processing. At Drupa, Futec showed new smart camera-based systems, where the image processing takes place onboard the camera, meaning inspection boards are no longer required. Also on show at Drupa were contact image sensors (CIS) from Mitsubishi and Tichawa. 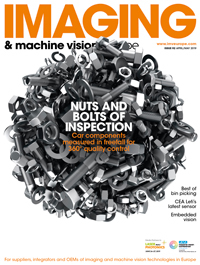 ‘Contact image sensors are getting a lot of traction in print inspection,’ stated Williamson. Stemmer Imaging supplies CIS devices from Mitsubishi. CIS can be installed close to the web of material, with built-in illumination, Williamson explained. The sensors give effectively a telecentric view of the material, where every pixel is vertical. This avoids distortion at the edge of the web, which is an advantage when inspecting multiple repeating patterns across the material. Line scan cameras can suffer from distortion at the edges of the scene, meaning print patterns at the edge look different to those in the middle of the web. A CIS is also pre-calibrated for print runs because it measures in dots per inch. Desi Tsolova, sales and marketing manager at Tichawa, noted that the company’s CIS scanner is used for both calibrating the inkjet nozzles prior to printing, as well as inspecting the finished web of material. Tichawa exhibited at Drupa for the first time this year. The company displayed its VariCIS multicolour CIS, which is ideal for inkjet and digital print inspection. The product has a working distance of 10mm, eight colour mix options, and three different resolutions. One of the advantages of using CIS scanners is that they can inspect glossy surfaces, like holograms on bank notes, along with matt surfaces, at the same time. The scanners can also inspect wet surfaces, important for when the print has just been applied. The inspection is made at high speed – the 1,200dpi VariCIS colour version operates at up to 20kHz, while the monochrome version can operate up to 61kHz at 1,200dpi. The big advantage though with a CIS is its size. ‘In most printing presses, there is not enough space for mirrors, optics and light sources,’ commented Tsolova. Tichawa’s CIS scanners range in width from 260mm to 2 metres 40cm. Williamson added: ‘CIS is making online web inspection systems smaller, because they are installed near the surface, and easier to set up, because they just need to be positioned above the web without worrying about lenses. We’re seeing a lot of developments.’ The first generation of Mitsubishi CIS is available from Stemmer Imaging, and there are new generations coming out soon that will increase the resolution and speed, according to Williamson. Speed and resolution are potentially limiting factors in CIS scanners, although progress is being made in these areas – Tichawa is working on a sensor that will run at 2MHz at 1,200dpi, alongside a 4,800dpi sensor. A line scan camera – which is the alternative to CIS scanners for print inspection – gives complete flexibility of resolution thanks to the lens – a different lens will change the field of view and increase the resolution. Line scan cameras reach 16k pixel resolution, but how they are mapped across the web is down to the lens. Some print inspection systems might have multiple line scan cameras across the web to achieve the resolution required. ‘With a CIS, the resolution is fixed; those are the lengths that have to fit on the web, whereas with a camera you can change the lens and height, and change the resolution,’ commented Williamson. The Mitsubishi CIS has a fixed number of dots per inch. The largest model, at 929mm, has 21,956 pixels. The A1 size of 690mm has a resolution of 14,600 pixels, while the 300mm version offers 7,300 pixels, which is effectively 600dpi. TDI tends to be used where production speeds are extremely high. It works by summing charge from the lines to give improved sensitivity in the low light levels that result from imaging at high speed. Teledyne Dalsa has introduced CMOS TDI cameras, which offer exposure control. Each sensor line has an exposure, which means it is now far easier to get consistent print inspection results in TDI, according to Williamson. A lot of print inspection is made in colour, and the level of detail of these measurements can vary considerably. Futec has a colour monitoring function in its inspection systems based on RGB information from the CCD line scan cameras. A colour calculation model calculates colour change to a level of ΔE3. To measure colour change at a level of ΔE1 requires a spectral colour camera. At the moment, Neumann added, offline handheld spectrometers are more accurate than inline spectral colour measurement solutions. ‘In the future, however, I’m sure this will be a standard feature in the inline process,’ he said. Inline solutions are becoming available and, at Drupa, US company QuadTech was showing its SpectralCam camera that uses spectrophotometer technology to make inline colour measurements. Developments in 3D printing in manufacturing have now reached a point where the printers are capable of building parts with dimensional tolerances equivalent to those of traditional machining techniques. Airbus, for instance, has started series production of 3D-printed titanium parts for its aircrafts. While metrology tools such as microscopy or profilometry can be used to inspect 3D printed parts, there is a need for an inexpensive automated system that can measure the tolerances of these components. US company Swept Image has released the SweptVue device, a digital line scanning confocal measurement system ideal for inspecting 3D printed parts. The SweptVue system is an adapter that replaces the observation tube of an Olympus SZX7 stereo microscope. The system uses one of the microscope’s two independent and parallel optical pathways to illuminate a part with lines of light from a Texas Instruments LightCrafter digital light projector. The other optical pathway channels scattered light onto a rolling shutter CMOS sensor in Point Grey’s 1.3 megapixel Flea3 USB 3.0 camera. The use of physically separate illumination and detection pathways in the stereo microscope creates an optical triangulation system for measuring depth. Light is captured from the sample at different depths by synchronising the time at which the light is projected across the sample with the position of the rolling shutter in the camera, which is controlled by varying the start of a frame exposure. By rapidly stepping through a series of camera trigger delays, the SweptVue system can then collate the stack of images captured at varying depths to produce a depth map. The system can automatically measure the micrometre-scale features of parts manufactured by a 3D printer. ‘While cameras with rolling shutters have been criticised for their performance when imaging moving targets, these characteristics were used to our advantage in the SweptVue system. By synchronising the illumination pattern on the part with the rolling shutter, light returned from different heights on the part is shifted laterally at the sensor, enabling features to be captured at specific depths. What is more, we can quickly shift between depths by changing the trigger delay on the Flea3 camera,’ said Matt Muller, co-founder of Swept Image. In a confocal microscope or profilometer, a mechanical stage needs to be moved to enable images of a part to be captured. The requirement for such motion control is one reason why conventional systems can cost more than $50,000. The cost of the SweptVue system, on the other hand – which requires no physical movement of a part – is estimated to be less than $10,000.